Chicago-based artists Jenny Kendler and Molly Schafer recently launched the Endangered Species Print Project. The ESPP offers limited edition prints of critically endangered species for sale to collectors, and ALL proceeds are donated to conservation programs working to perpetuate the featured species. For each print edition, the total number of prints corresponds to the featured animal's current population. 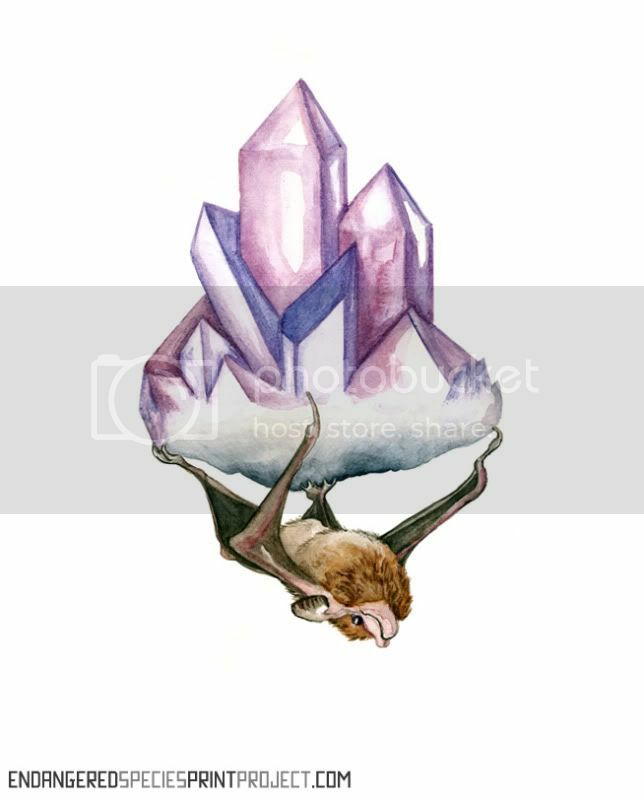 For example, only 37 Seychelles Sheath-tailed bats remain in the wild, so for that edition, 37 prints will be produced. The ESPP is already generating buzz. The Center for Biological Diversity and The Sierra Club are both promoting the project and have expressed interest in collaborating with Schafer and Kendler. I'm not surprised. The ESPP is a terrific undertaking, a fine example of the sort of environmentally and socially responsible efforts that I dearly wish more contemporary artists would involve themselves with. As such, I'd promote ESPP even if I weren't planning to produce some prints for the project. I expect to produce two original drawings that will be turned into prints before the end of this year. My subjects will be the Javan, or Sunda, rhinoceros (Rhinoceros sondaicus) and the red wolf (Canis rufus). Also, in 2010, I hope to produce prints featuring other endangered species, including some birds, reptiles, and plants. Prints of the following species are already available: the Panamanian Golden frog (Atelopus zeteki); the Vancouver Island Marmot (Marmota vancouverensis); the Seychelles Sheath-tailed bat (Coleura seychellensis); and the Indri lemur (Indri indri). Visit the ESPP site to learn more. Thanks for posting Christopher. We're thrilled to have you on board! Any update on what happened here? Looks like they stopped producing prints in November. There are a number of prints forthcoming, including two of mine. I also know of a small host of other artists working on prints for the project. I believe the slow frequency of new print offerings is principally the result of ESPP having to wait for artists to finish work. The ESPP blog is updated regularly, and Jenny and Molly are hard at work promoting the project, attempting to develop a larger audience for it...in the hopes of generating more money for the non-profit organizations working to protect endangered species through habitat preservation, breeding programs, and research.